Join Sonic Bothy for an eclectic programme of free and fixed original music exploring the ensemble’s diverse interests in improvisation, chamber, experimental and dance music. Music for harmonium, strings, vocals, percussion & new, specially commissioned glass instruments. 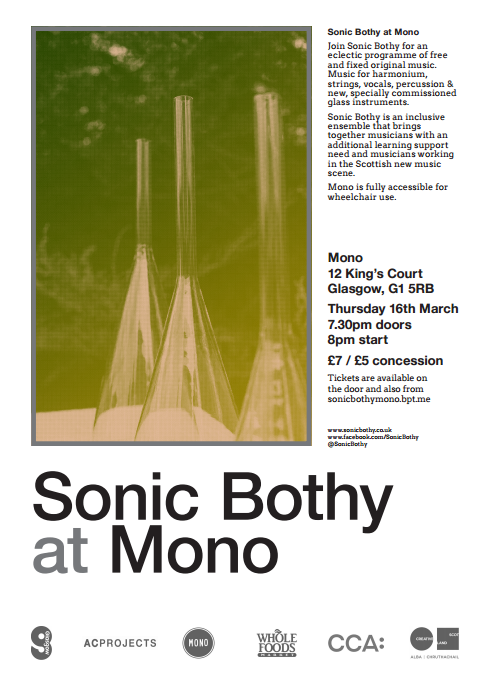 Sonic Bothy is an inclusive ensemble that brings together musicians with an additional learning support need and musicians working in the Scottish new music scene. In recent years, Sonic Bothy has played at Counterflows, GIO Fest V – VII, Sound Festival and as part of City Halls ‘Sound Lab Presents…’ Series. Mono is fully accessible for wheelchair use.